Microgaming’s Rugby Star was released in time for the Rugby World Cup, and fans of that sport will flock to it. However, will it remain such a crowd pleaser once the World Cup is over? It is really too hard to call. Rugby Star was released at just the right time. The Rugby Star slot first appeared in time for the Rugby World Cup in 2015. Although it is not officially licensed, or anything of the sort, there is still a certain degree of realism to the game, which is more than can be said for some of Microgaming’s other sports themed slots. The Rugby Star slot game is played over 5 reels and 243 paylines, and offers a top prize worth 600,000 coins. Graphically, Rugby Star isn’t that bad. 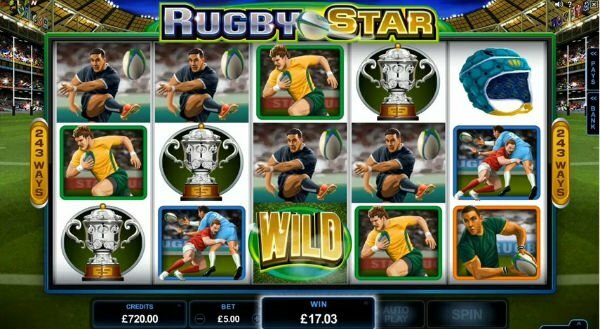 We’re pleased to tell you in our Rugby Star slot review, that the Rugby Star slot graphics are actually rather impressive. You can ever see a bit of realism in the “stars” which appear as icons in this game. Aside from the rugby players, other imagery includes a silver version of the Webb Ellis trophy, a stadium, a head protector, and a set of rugby boots. Microgaming’s Rugby Star video slot can see you able to select coin sizes which start out as low as 1p, but can rise as high as 50p. You will also be able to wager as many as 10 coins per spin on this slot. Paylines are naturally non-adjustable, though. Players hoping for a cheap ride on Rugby Star can play for just 50p a spin, whilst maximum stakes are fixed at £250 a spin. 50p a spin is rather sizeable for a Microgaming developed 243 ways to win slot (especially when most cost 25p, or 30p tops), so you’ll be hoping the special features more than make up for that. Rugby Star game provides great features to keep you occupied. 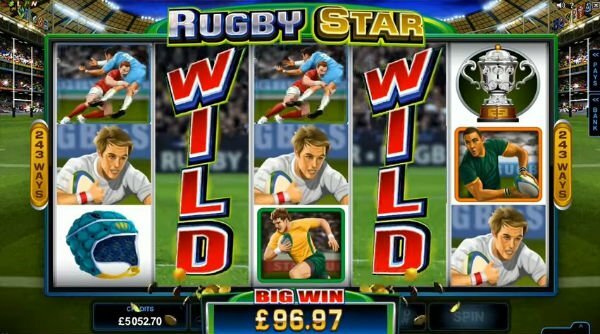 The Rugby Star logo is the main special icon in the game, and one of the best Rugby Star slot bonuses you can pocket. It appears stacked on the third, fourth, and fifth reels, and is capable of appearing with more than 40 wild symbols at once. It can also substitute for all other symbols in the game, barring the scatter, as you will probably expect. At any point in the game, the Wild Pass Feature may be activated. When it is, up to 2 reels can turn entirely wild. The second, third, and/or fourth reels will be completely wild which guarantees you a win. 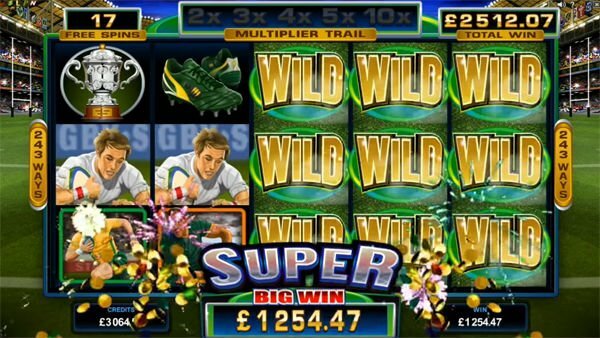 Rugby Star’s scatter icon is the rugby ball, and it can be used to trigger free spins, as well as bag scattered wins when 3 or more such symbols appear anywhere on the reels. The Rugby Star slot machine’s bonus round is triggered by landing 3, 4 or 5 of the scatter icons anywhere on the screen, as we have mentioned. This will instantly trigger a free spins bonus round consisting of 15, 20, or 25 free spins, respectively. During the free spins bonus, a Rolling Reels feature is also present. These can see you pocket rising multipliers for consecutive wins. It is possible to win up to 10x multiplier by bagging continual wins in this bonus. Microgaming’s Rugby Star was released in time for the Rugby World Cup, and fans of that sport will flock to it. However, will it remain such a crowd pleaser once the World Cup is over? It is really too hard to call. This is a bit of a concern. Also, it is notoriously expensive to play for a 243 ways to win slot. Still, its special features do make it appealing, and if you love rugby, it is the definitive rugby slot out there at the moment.